What are Broker Beneficiary Holdings? Home/Trading Platforms/SAMCO STAR/What are Broker Beneficiary Holdings? A client has to open a demat account with a Depository Participant (DP) to hold his shares in the dematerialized form. If the shares are bought by the client from the exchange but the client does not have sufficient balance i.e. Debit balance or lower credit balance than required in his ledger account, the broker has the option to hold the shares on behalf of the clients. However, the broker cannot hold the shares in its name and thus holds the share in a separate account known as “Broker Beneficiary A/c”. The holdings in such account is known as Broker Ben Holdings or Broker – Client Beneficiary Holdings. Also, a client can have a demat account with a third party DP other than his trading broker. In such cases, the client needs to first transfer the shares to the broker where he wishes to sell the shares. Since the client does not have his own demat account with the broker, the holdings are temporarily held in the Broker Ben Account and the holdings are known as Broker Beneficiary Holdings. The broker will allow to sell the shares only if the holdings are available in the client demat account or the broker beneficiary holdings. Since the beneficiary of the shares held in the Broker Ben Account are the actual clients, all dividends, bonus’, splits, etc on account of the shares accrue to the clients only and are credited to the clients accordingly. 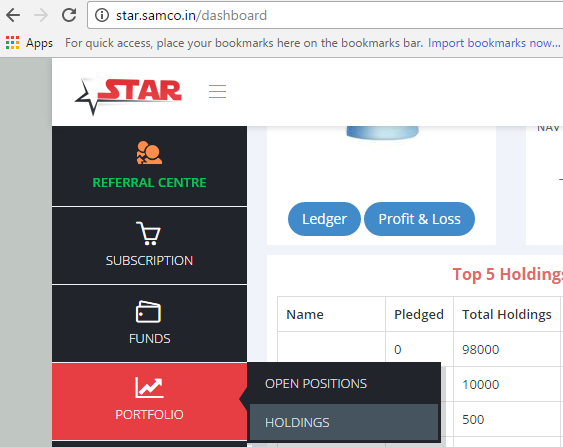 To view the Broker Beneficiary holdings in the back office – SAMCO Star, after login, click on the tab “Positions” and select the option “Holdings”. This shall display the holdings of the client. As can be seen above, this detailed window shall display the Broker Beneficiary Holdings. What are Collateral Holdings or Pledged Holdings? What are unsettled holdings or T1 holdings? What is my STAR Back office password? How to change back office password?